Almost a year ago, David Smith released Workouts++, an alternative to watchOS’ built-in Workout app that adds an iOS component to leverage the data collected during workouts. Today, Smith released version 2.0 of Workouts++ with a host of new features enabled by advances in the Apple Watch and Apple’s health and fitness APIs, including podcast playback, location tracking and mapping, support for new workout types, Siri integration, and more. On top of that, Workouts++ is now free with no In-App Purchases, advertising, or subscription. I’ve tried a lot of different workout apps and been disappointed by most of their watchOS apps in one way or another. Sometimes the problem is the Watch app’s performance. Other times, the issue is a design choice that emphasizes information that I don’t care about. Workouts++ avoids those pitfalls a couple of ways. First, the watchOS app is as fast to start and easy to use as Apple’s Workout app. The app has never held me up when I’m ready to go out for a run. Second, the watchOS UI is fully customizable. 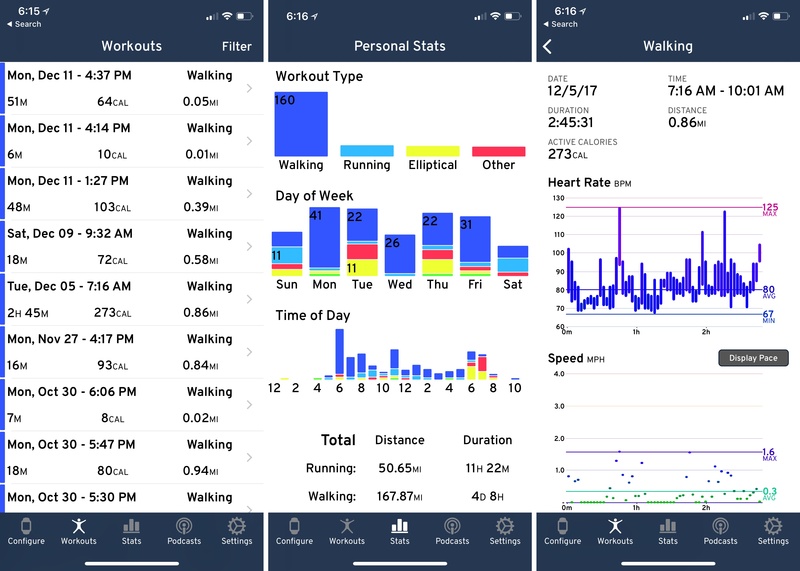 From the iOS app, you can pick from a wide array of workout types and Watch UI layouts, so the app displays the real-time statistics that matter to you most. The iOS app makes great use of the workout data the Watch app collects. Tracking workouts is personal. Two people who do the same type of workout are unlikely to have the same goals. One runner may be targeting a certain heart rate, while another is working on hitting a certain pace for an upcoming race. 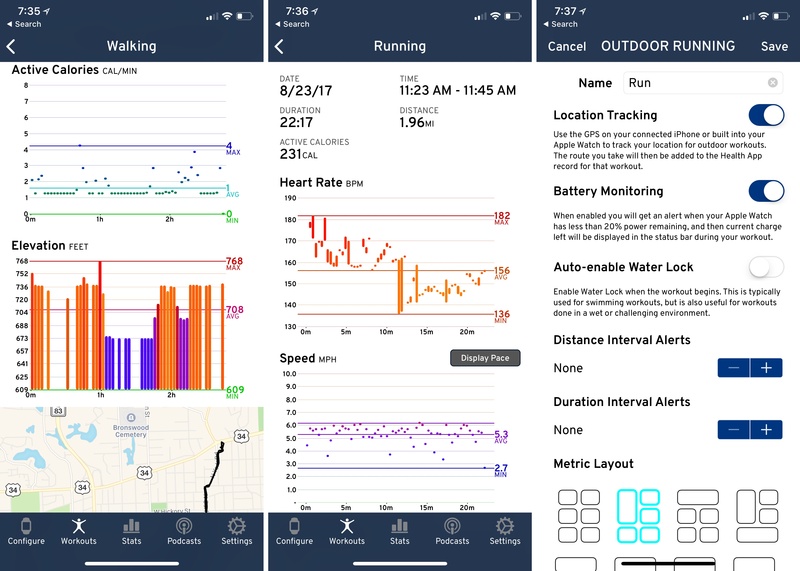 Apple’s Workout app is a good way to get started with tracking workouts, but Workouts++ embraces the differences between people's workout goals by providing ways to monitor the information that is most relevant to them. It’s that ease-of-use coupled with personalization that Smith has extended with version 2. The LTE radio in the Apple Watch Series 3 has been a boon for exercising. I love the ability to get notifications and stream music over a cellular connection directly to my Watch. At the same time though, the Series 3 immediately left me longing for a way to listen to podcasts when I exercise. Podcast episodes are color coded according to their Watch status. Workouts++ has come up with a solution that works surprisingly well given the audio API limitations of watchOS. 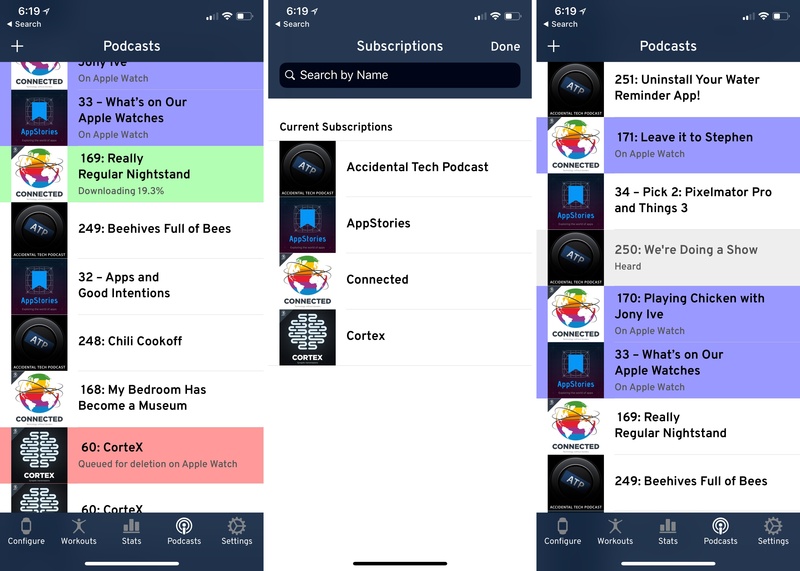 It has a dedicated tab in the iOS app where you can subscribe to your favorite podcasts, which show up in the ‘All’ section of the tab. 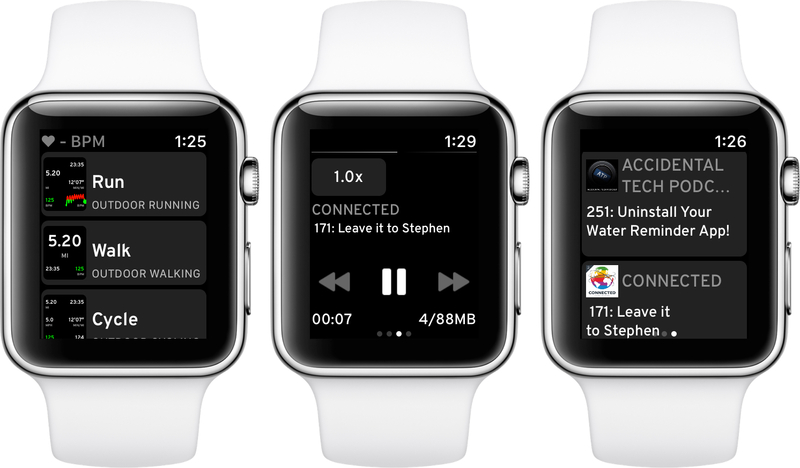 If you tap on an episode, it downloads and is transferred to your Apple Watch, a process which can take a while. The advantage of downloaded episodes is that there’s a little button on the Watch’s playback screen to skip ahead and back 30 seconds or one minute at a time depending on the length of the episode. When you start a workout on your Watch, you simply swipe left once to display two sets of podcast episodes. At the top of the view are the downloaded episodes that play immediately when you tap the play button. The remainder of the podcast view lists streamable episodes. Tap one of those episodes and it doesn’t start playing until (at least in my tests) about 4 MB of data has been transferred to the Watch. The initial buffering doesn’t take very long on a good connection, but if you’re headed out for a run, the wait can feel longer than it in fact is. In my tests, the podcast feature worked well when I tested it with episodes of varying lengths. The primary downside, however, is that these episodes are only available when you’re working out and there’s no way to sync the play position to another podcast player for when you’re no longer exercising. Still, the option of brining my favorite podcasts with me when I exercise is a fantastic addition to the app. Version 2 of Workouts++ now has location tracking and mapping too. Tapping a workout entry in the iOS app opens its detail view, which now includes a map of your training route. There’s also a map under the Stats tab, which shows all your routes at once. The workout detail view and Watch layout configuration screen have been redesigned. Workouts++ continues to be one on of the most versatile, adaptable workout apps available. It’s an app that is perfect for anyone who feels constrained by the built-in Workout app on the Apple Watch or who loves to tinker and customize their app experiences. Workouts++ is available on the the App Store.